United by our passion for adventures, at HCG we enjoy challenging experiences and benefit from the diversified skills and competences of our young and talented team. 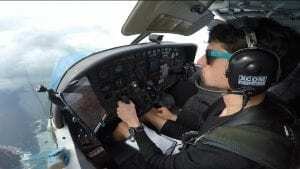 Our latest thrill is … parachuting, some of us diving in the sky and others – behind the controls of the plane. 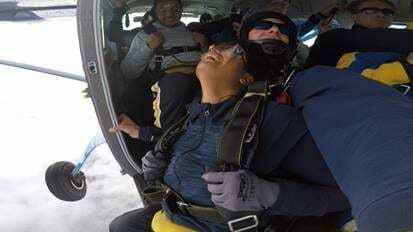 Here is the exciting story of Dimple’s first skydiving experience out of an airplane piloted by Clinton! These two are excellent team players in and out of the office! It was a beautiful sunny Saturday morning, a short road trip away from the city and I was ready to embark on a new adventure which I shared with my husband. As we were getting closer to the location, our excitement level was reaching a peak and…. bummer, it started raining. After a long anxious wait for an hour, Mother Nature was kind to us and we finally started prepping for the most exhilarating experience of our lives. All geared up, I took a few photos and set to walk towards the airplane with my instructor. Do you know what was more exciting? 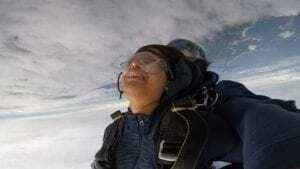 I was jumping out of a plane piloted by my fellow colleague at work Clinton. After listening to hundreds of his flying stories it was finally my turn to experience skydiving in live and I felt so happy doing so. As I was walking towards the plane, I was constantly asked if I was feeling nervous. 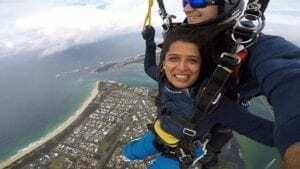 For a very strange reason, I wasn’t scared or nervous – perhaps because the kick of adrenaline was so high! The cherry on top moment was when I was told I would be the first to jump out of the plane from the group. 13,500 feet off the ground, the plane shutters opened. A gust of wind blew into my face and I could no longer control my movements. It then struck me that this was the epitome of our lives …. Finally my instructor asked me to lean my head over his shoulder and “boom” we were off the plane. In that split second I felt so connected to my inner being. It was so rejuvenating to stretch my hand and experience how a bird feels flying in the free sky with absolutely no worry in the whole wide world. We wish to experience this moment too, Dimple. Thank you for sharing your story, you promised to join us for another jump! 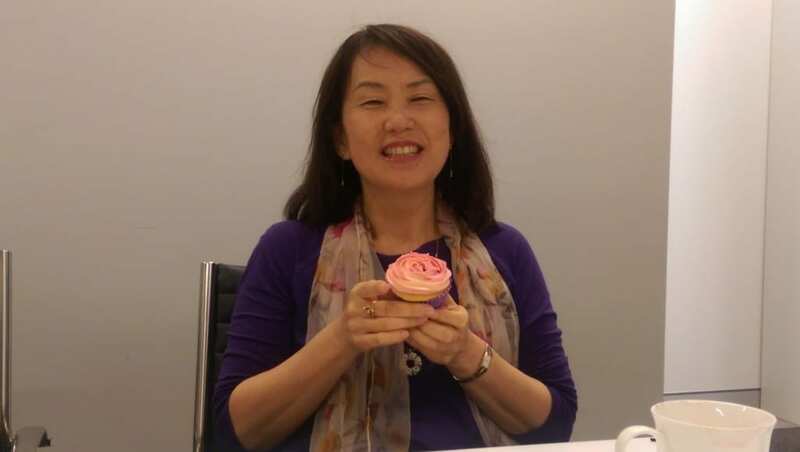 Today it is with a heavy heart that we farewell the beautiful Nobuko Matsuda. Nobuko has been with the firm for 7 years and in that time her work ethic and loyalty have been absolute. We are so grateful for her commitment and contribution to our success and ongoing support to the team, management and clients. She will be dearly missed and we can only hope she finds her way back to us in the near future. However we are happy that Nobuko is following her dream and passion to live in Italy! Why did you choose Hall Consulting Group? I was impressed with the firm brochure you had at the old reception desk! What has been your favourite event/time at HCG? I always enjoyed the team environment and spending lunch times catching up with everyone around the office kitchen. The Melbourne Cup lunches we do each year are always a highlight, I’m glad I have been invited to come back next week to attend one last one! When I had strong input in the organisation of a property investors seminar and contributed ideas to systemising our work processes. Do you have a message to the clients? I wish to thank our clients for giving me the opportunity to work with them. It was my pleasure to work along with you and get to know some of you. I wish everyone successful business ventures and balance with your family life! Do you have a message to the team? Thank you for your support and assistance with various work assignments. It was very nice working together with you all. Venetta and Andrew – thank you for your guidance and mentoring over the last 7 years my growth and professional development. Chris – I wish you every success with your ventures. Please keep going at least for another ten years! I will be off to Italy to eat pizza and pasta! Hope to improve my Italian language & cooking skills there. I am so excited to start my next adventure.